At Grant Park Legal Advisors LLC, Vincent Auricchio is here to serve our clients’ needs. Vince brings impeccable credentials and exceptional legal experience. Vince, as a committed Christian, has demonstrated honesty, integrity, and a passion, for helping clients that represents Grant Park Legal Advisors' core values. With over 20 years of experience as an attorney, Vince has the knowledge to help clients in a wide variety of legal settings. From providing representation in over 2000 real estate matters to serving as a speaker for the American Association of Neurological Surgeons on multiple occasion. Speaking on the preparation of medical and legal testimony, Vince has demonstrated his ability to master the situation and provide the advocacy and support his clients need both in and out of the court room. Vince has received a variety of accolades in his professional career. 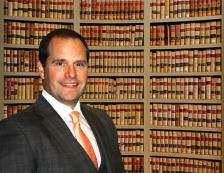 In 2012, Vincent Auricchio was selected as a National Trial Lawyers Top 40 Under 40 as a personal injury litigator. This honor is by invitation only and is extended exclusively to those individuals who exemplify superior qualifications, trial results, and leadership as a young lawyer. In years past, Mr. Auricchio was selected as a Super Lawyers “Outstanding Young Attorney” and “Top Young Attorney in Illinois” in the fields of real estate law and business litigation (2008, 2009, 2010 and 2011). More recently, Mr. Auricchio was appointed as a member of the National Association of Distinguished Counsel (Top One Percent) for 2015 and 2017. Vince obtained his Juris Doctor from the DePaul University College of Law in 1997, and holds a Bachelor of Science from Vanderbilt University that was obtained in 1993. Grant Park Legal Advisors LLC is proud to bring this level of skill and talent to you. Vince looks forward to meeting with you and providing the legal support you need. Vince may complete your closing through Auricchio Law Offices LLC.